Today we have the fun, bright work of Margot Tissot who designs just about everything for her brand Des Sottises. You can find her illustrations on cards, posters and prints, tote bags, and even as pins — one of her favorite products to create! 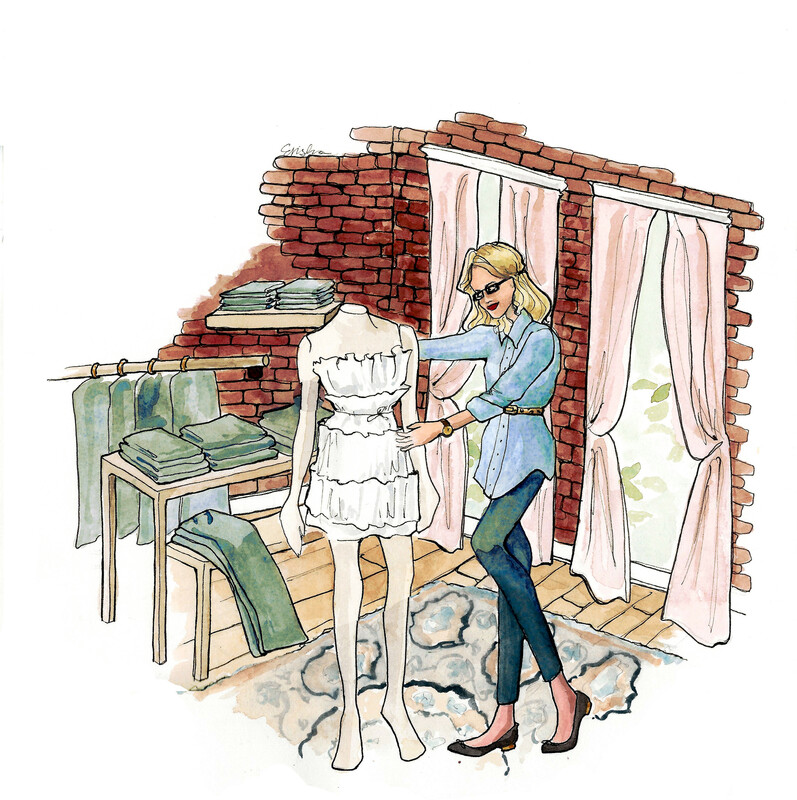 Her shop is based in Switzerland and we love getting to showcase amazing creatives and shops from all over the world! 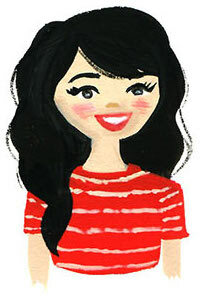 The images she illustrates are largely based off of things that inspire her, or are part of her daily life, which creates such a personal product! And we can’t help but just love that she illustrates veggies and makes stuff like broccoli and lettuce look pretty cool. 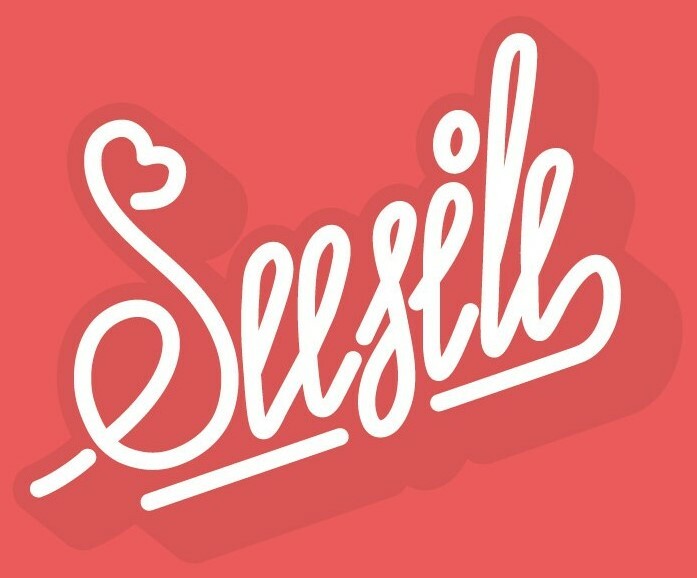 Des Sottises has such an amazing diversity of illustrations and products, so keep reading to see more and learn about the maker behind the brand! : How did your shop Des Sottises get its start? : Des Sottises started in between two jobs. Last year, I lost my dream job for economical issues and I had a few weeks of unemployment. So I took advantage of this time to create my Etsy shop and created a lot of illustrations. I started with the animal alphabet, I made one illustration for each letters and searched for various supports to put them on. The animal alphabet poster, bookmark and pennant were my first items to sale. Today we’re featuring the whimsical works of Lauren Lee, an illustrator who works in advertising by day but creates amazing illustrations every free chance she gets! We are in love with the characters and scenes she creates in her work – honestly we’re crossing our fingers a coffee shop gets her to design their cups, because we’d be there ASAP! 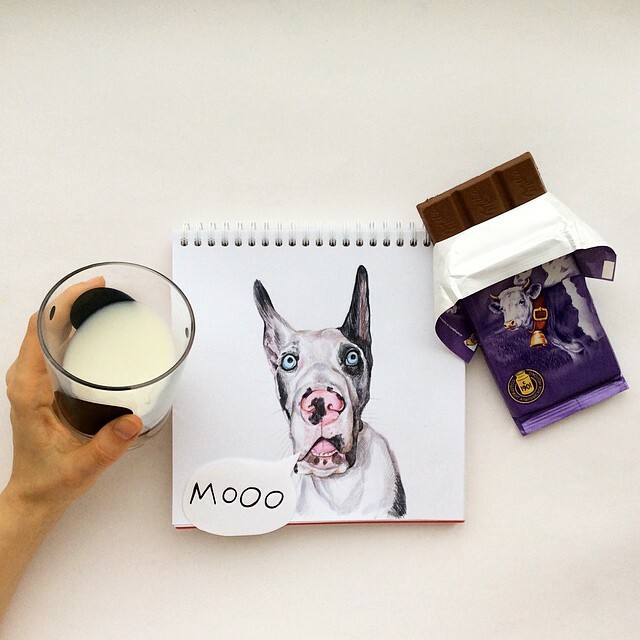 Keep reading to hear more about her creative journey and see her fun coffee cup and sketchbook illustrations. : I’m a twenty-two year old designer working in the crazy world of advertising. I use illustration as a way of release. Outside of design, I love animation films, re-reading Harry Potter, and binging title sequences. 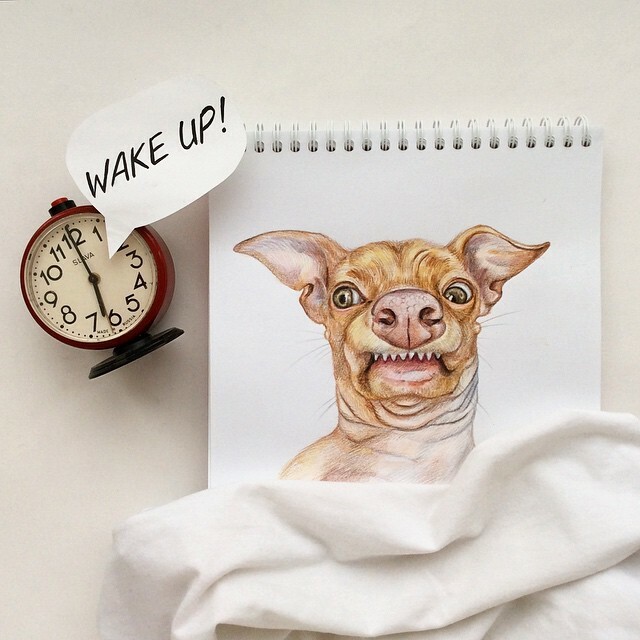 This week we talked to Valeria Susloparova of @vsusik, who has a large Instagram following for her amazing dog illustrations. 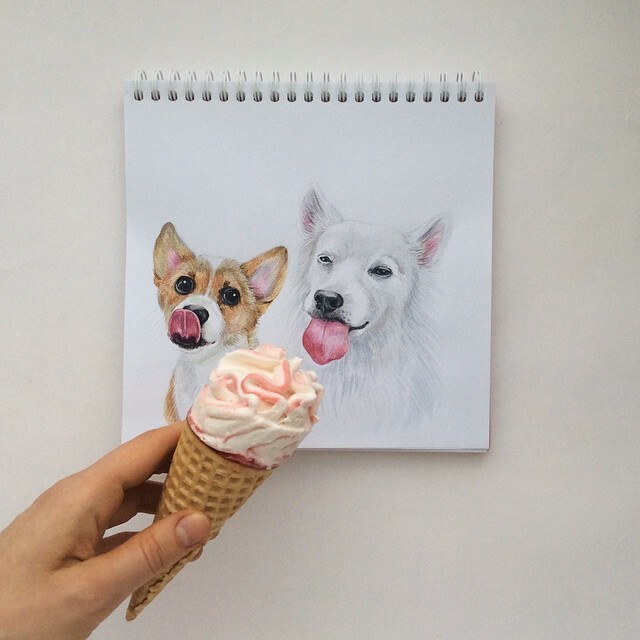 We love this feature, because these aren’t your typical illustrations. She finds ways to make them unique and integrate 3D components, all while making her subjects have personality. 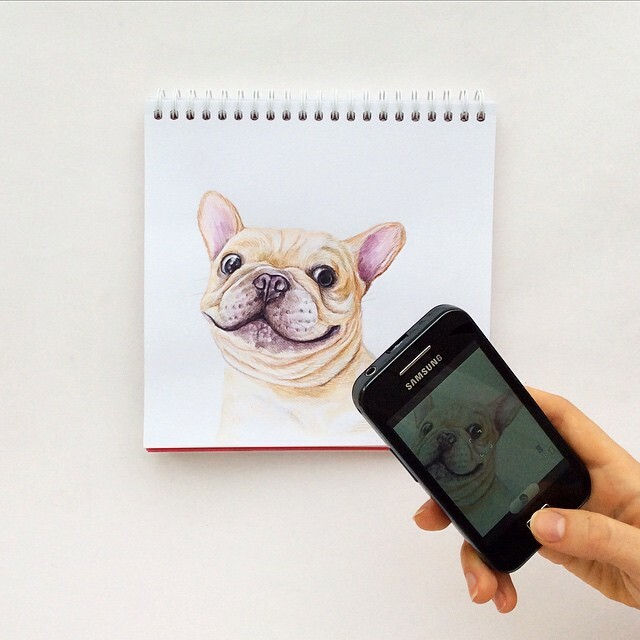 From the drawing skills it takes to create the dog, to the element she adds to make the portrait humorous or cute, we can’t get enough of her work! 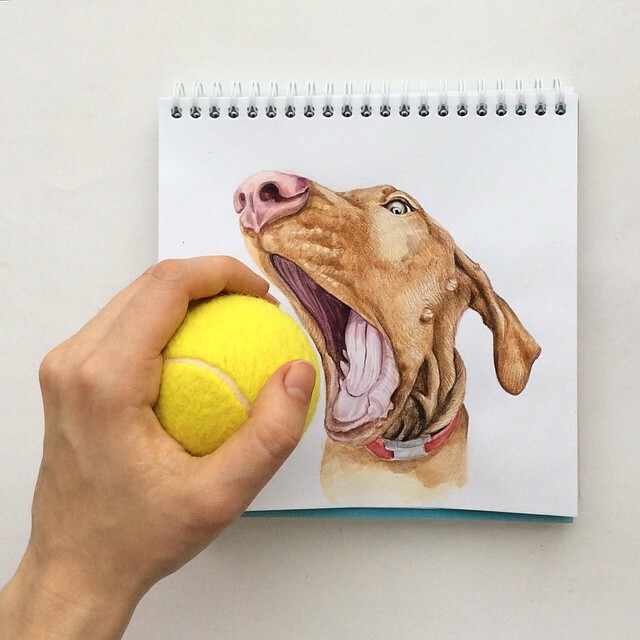 She has always wondered what dogs are actually thinking, and her art really shows this thought process. Keep reading to hear more about Valeria and see some of the funniest dogs you’ll probably look at all day. : My name is Valeria Susloparova. I was born in Russia and I have still lived here. My specialization is graphic design. I have been drawing all my life. I tried different painting techniques and materials, but I especially like watercolor painting. I have a gold labrador. He is my big love and inspiration. I enjoy reading, watching films and series, riding bicycle and nature. 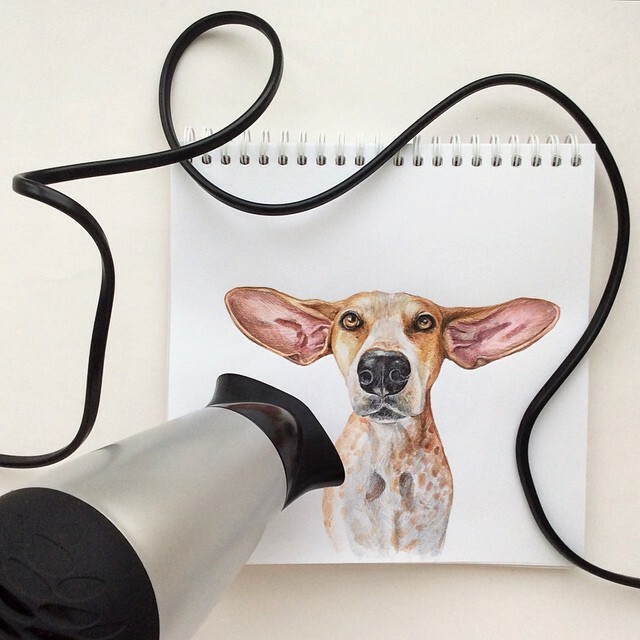 : How did you find your style of mixing illustration with physical objects? : It all has happened in a creative process. I continue developing my skills in this direction. 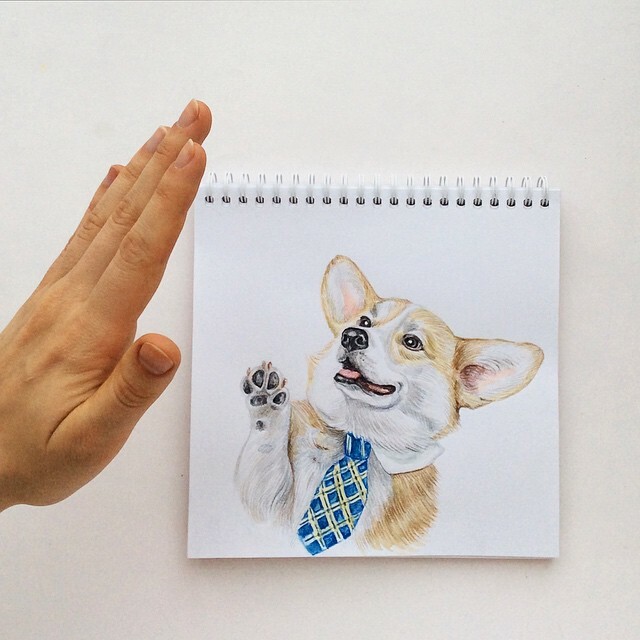 : You paint a lot of dogs. What about them inspires you to create your pieces? 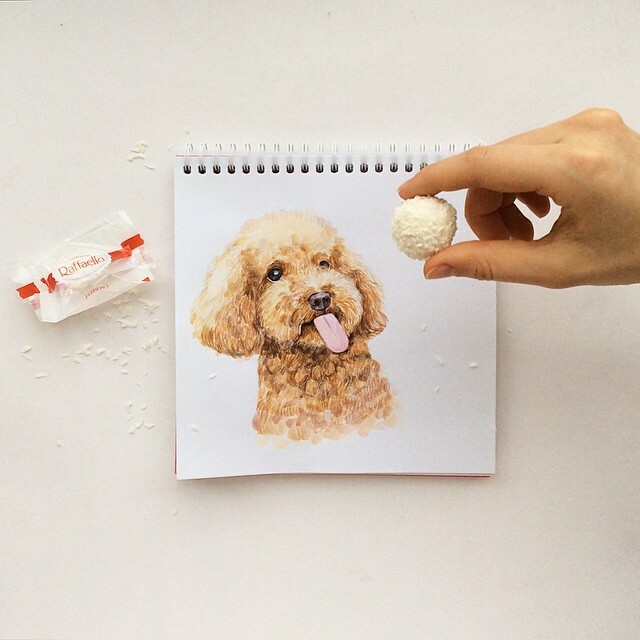 : Yes, basically I draw dogs but I can create illustrations using different techniques. Dogs…Their funny and cute faces inspire me. I wonder what they are thinking about and I try to reflect it in my illustrations. : What art supplies do you use most for your work? 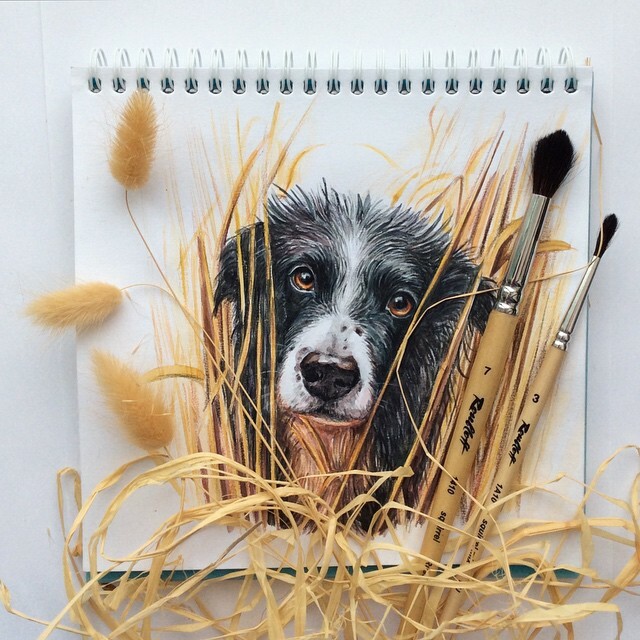 : I work with watercolor and use watercolor pencils to breathe life into my paintings because I like the way they depict the texture of animal fur. : Do you sell your work or take commissions? : It has always been my hobby. There are a lot of requests and offers to make more illustrations now. I put not only time but also love into my paintings. If I need to give someone my illustration, I am really upset. But I am glad, if painting has a new home, a new ‘owner’. Unfortunately, I live in Russia and I can’t guarantee safe delivery of my works. I can send them with pleasure but only electronically. And there are some advantages in this way of delivery: One, you have to wait a few seconds to get it, and two, you can print it in any size using any paper. : Do you have an illustration that is your personal favorite? : It’s difficult to choose a special one. 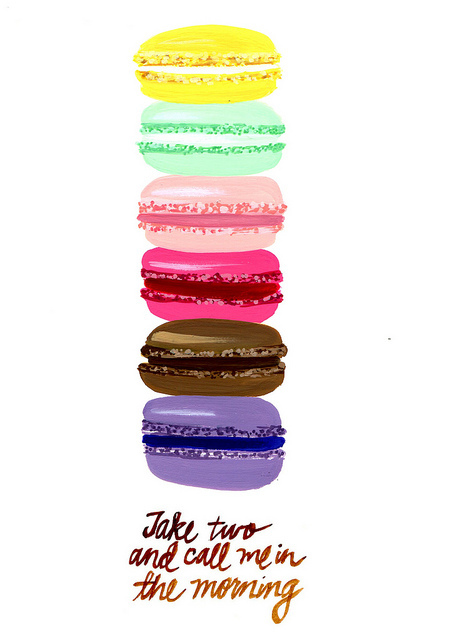 I love all of them! : You graphic design and illustrate. What do you like about each? : I am trying to keep up to different innovations in this sphere of art. There are a lot of talented people in this area. They motivate me to develop and create in order my works to be more interesting and high quality. : When did you start using Instagram to share your pieces? : Firstly, it was my personal Instagram profile but when I posted some illustrations, it become something more. Now, it’s dedicated to my works. : What are some of your goals for 2015? : To draw! To paint! And once again – to paint! It’s necessary to develop yourself constructively and creatively. Then, I really would like to travel. Also, a long list of books to read is waiting for me. : Any advice? : If you are a beginner in painting and face some difficulties and failures, the most important thing is not to lose heart but to continue working. Paint every day, develop your world outlook! Learn and study more, examine the works of more experienced artists. Dream up and improvise, be bold and take risks. Love what you do. It is sure to “yield fruit”. Today we are featuring Erisha from A Thing Created Illustration. We love her work because it is filled with charm, simplicity and glamour all at the same time! We also think it is great that she found a creative outlet that combines all of her inspirations. It reminds us that even though we all have limitations for what we can take on at one time, we do have the ability to create. So, follow in Erisha’s footsteps and create a world where you can tackle it all. For example, if you love fashion, baking and graphic design, use your imagination to develop something that culminates all of these interests. If Erisha found a way, so can you! Read on for a great interview as well as all the ways you can keep up with A Thing Created Illustration. : What draws you to illustration? — For me, it’s a way of celebrating beauty, and the best creative outlet in the world! I’m so inspired by so many creative industries – decorating, cooking, design, fashion – and I’ve always loved, arts, culture, beautiful cities – illustration lets me be a part of all these creative worlds with just a paintbrush and pencil!